I believe it is important to present the facts, not just the spin, put on the review process by animal rights activists. For a UW-Madison scientist to conduct any experiment with an animal, he or she must submit a 35-question animal care and use protocol application to one of the University's Animal Care and Use Committees (ACUCs). 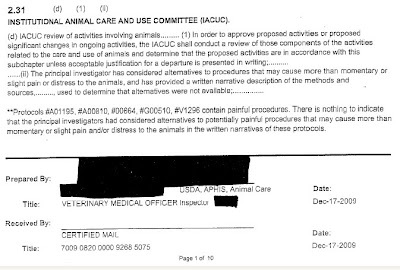 The protocol must describe specifically what the animals will experience, and what steps will be taken to minimize pain or distress.” Public Does Know About Experiments. Eric Sandgren, Director, UW-Madison Research Animal Resource Center. April 23, 2005. Madison.com. There is something deeply, profoundly evil in this admission. Isa T, Yamane I, Hamai M, Inagaki H.
Section for NBR Promotion, National Institute for Physiological Sciences, Myodaiji, Okazaki, Japan. The Japanese macaque (Macaca fuscata), along with rhesus and long-tailed macaques, is one of the macaca species. In Japan, it has been preferred for use as a laboratory animal, particularly in the field of neuroscience, because of its high level of intelligence and its gentle nature. In addition, the species has a relatively homogeneous genetic background and field researchers have accumulated abundant information on the social behavior of wild Japanese macaques. As future neuroscience research will undoubtedly be more focused on the higher cognitive functions of the brain, including social behavior among multiple individuals, the Japanese macaque can be expected to become even more valuable as a laboratory animal in the near future. The Ministry of Education, Culture, Sports, Science and Technology has launched a National BioResource Project (NBRP) to establish a stable breeding and supply system for Japanese macaques for laboratory use. The project is in progress and should lead to the establishment of a National Primate Center in Japan, which will support the supply of monkeys as well as social outreach and handling of animal welfare issues. I am commenting here on the blog post by Dario Ringach, a researcher who claimed to have stopped experimenting on monkeys after being harassed by animal rights activists. Dario Ringach swore that he had stopped vivisecting monkeys. His statement to that effect was spread around widely and was used by the vivisection community as evidence that intimidation had stopped “important” research. It appears that he was either lying all along or else has decided that he won’t be harassed again, but I don't believe that the people who were pressuring him previously won't do so again... maybe he thinks that people have forgotten about his cruelty. Nat Neurosci. 2009 Jan;12(1):70-6. Epub 2008 Nov 23. Stimulus contrast modulates functional connectivity in visual cortex. Nauhaus I, Busse L, Carandini M, Ringach DL. Angeles, 405 Hilgard Avenue, Los Angeles, California 90095, USA. Neurons in visual cortex are linked by an extensive network of lateral connections. To study the effect of these connections on neural responses, we recorded spikes and local field potentials (LFPs) from multi-electrode arrays that were implanted in monkey and cat primary visual cortex. Spikes at each location generated outward traveling LFP waves. When the visual stimulus was absent or had low contrast, these LFP waves had large amplitudes and traveled over long distances. Their effect was strong: LFP traces at any site could be predicted by the superposition of waves that were evoked by spiking in a approximately 1.5-mm radius. As stimulus contrast increased, both the magnitude and the distance traveled by the waves progressively decreased. We conclude that the relative weight of feedforward and lateral inputs in visual cortex is not fixed, but rather depends on stimulus contrast. Lateral connections dominate at low contrast, when spatial integration of signals is perhaps most beneficial. 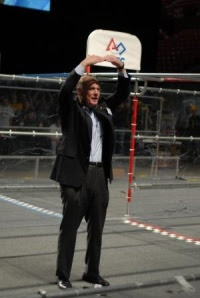 Shortly thereafter, I was threatened by Roberto Peccei, UCLA’s Vice Chancellor for Research. Dr. Ringach did stop doing experiments involving animals in summer 2006. The paper in question represents work he did before that time. Now that you have been made aware of this I would ask you to retract your blog, otherwise I will consider you personally responsible for any further harassment Dario may suffer. It seems to me that Ringach has been working pretty hard lately to call attention to himself. I support his right to speak his mind, good for him for doing so, but it seems pretty clear that the claims made by UCLA, claims that fueled passage of the AETA, that researchers were being frightened away from using animals, appears to no longer be true, if it ever really was. Like their claims about saving human lives by hurting and killing animals, the claim about scientists being frightened off appears to be hyperbole intended to benefit only themselves. At the last Pro-Test for Science rally (then UCLA Pro-Test) I was trying to explain opponents [sic] of research that the images of bleeding monkeys shown in their signs were either from decades ago or from other countries, not the US or the European Union, and certainly not representative of research at the University of California. I don’t know which pictures he is referring to because I wasn’t at the rally. If he is referring to the photograph on Logothetis’s website, then he is at least correct about that picture not coming from the US or the EU. The monkey in the image on Logothetis’ website is Malish who was used at Hebrew University laboratories in Jerusalem, Israel in about 2000. As far as the photographs of Malish or photographs of other monkeys sometimes seen on posters not being representative of research at UCLA, we can’t really make that determination one way or the other, because UCLA won’t let the public see what is going on in its labs. On the other hand, the agencies that oversee research at UCLA are the same ones that oversee research in the preponderance of labs in the US receiving federal funding. 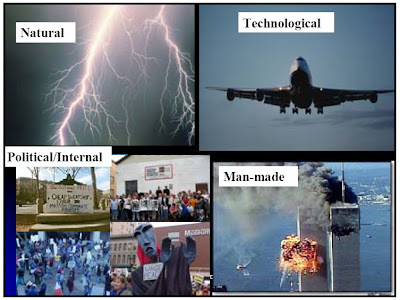 The director of the NIH Wisconsin National Primate Research Center, Joe Kemnitz, has pointed out that all such labs in the US “operate in the same way.” So, looking around our own country, contemporary images probably are representative of research at UCLA. 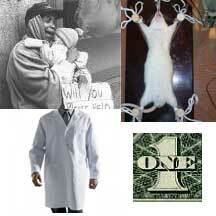 The undercover images from within the Covance lab in Virginia are one example. The photos of the capuchins used by Daniel Casey at the Oregon National Primate Center are another. And we can only wonder at what was shown on the 628 videotapes of over fifteen years of research that were shredded by UW-Madison to keep the public from seeing them. Also, speaking of Daniel Casey’s research and Ringach’s broad claim about research at UCLA, it bears repeating that when Matt Rossell’s undercover video from the Oregon Primate Center was seen by researchers there, behind the public relations effort to whitewash his report there was an internal response to the obvious suffering being endured by Casey’s subjects. Casey was studying psychotropic drugs. Some of the monkeys had been receiving injections of Haldol and Haldol-like drugs for over twenty years. The monkeys had developed severe and debilitating dyskinesia. The internal concern led to Casey’s monkeys being sent to a sanctuary. 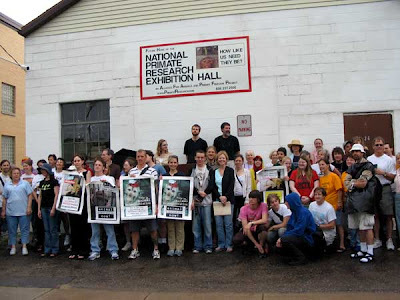 The point is that few people at the primate center knew about the suffering in Casey’s lab, and at least some of them were making public statements about how all the animals there were well cared for and that the research was subject to strict oversight. I doubt that Ringach has more than passing knowledge of what’s actually happening in UCLA’s many labs. To counteract the effect of such misleading images, one of my colleagues in Germany has made a large amount of information available to the public . . . There really isn’t a “large amount of information” available. 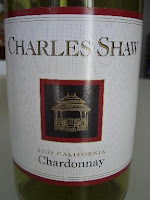 There is some, but what’s there is carefully chosen and composed. More about that later. This isn’t true. If it were, universities would not resist public records requests asking for protocols. The Methods sections of published papers are frequently short summaries of what was actually done to the animals. 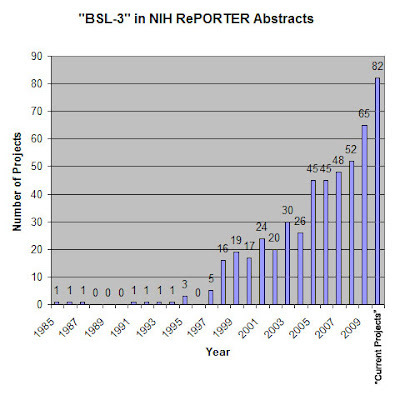 Often, in a published paper, an author will say that the method(s) they used were described more fully in a previous paper, and often that paper itself will say that the methods being used were previously described elsewhere. This means two things: Ringach is wrong when he says that methods can be learned from reading a published paper, and also, that many of the methods used today have been used for years, sometimes for decades, which could mean that even some of the older photographs aren’t really out of date. 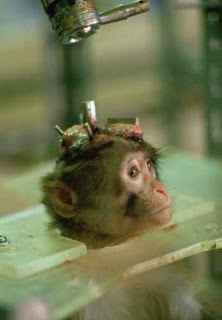 It is true that some of the hardware being used has been refined, but monkeys are still being kept in small cages, strapped into chairs, and have electrodes implanted in their brains and other organs. That hasn’t changed. ... but also illustrating the experiments with both actual pictures and videos taking [sic] from his laboratory. Let’s think about those pictures, videos, and the claims being made about them, but first, Ringach’s caption under the image of Logothetis’s surgical suite deserves a response. The surgical suite of Prof. Logothetis showing anesthesia and monitoring equipment comparable to those found in the best human surgical suites in hospitals. So what? Can’t someone be hurt or tortured in a modern surgical suite? As far as I know, criticism of the Tuskegee syphilis studies, the Cleveland radiation experiments, or even of Mengele’s twin studies never focused on or even mentioned the modernity of the equipment or the cleanliness of the room where the experiments took place. On to the images and videos. You can see some of the monkeys in a group-housed setting, and, if this was how monkeys in labs everywhere were housed, their lives would be much less miserable than they generally are. But in the videos on Logothetis’s website, it is clear that this isn’t how all the monkeys are housed, and at least some of them appear to be housed individually, a condition that is inherently cruel. 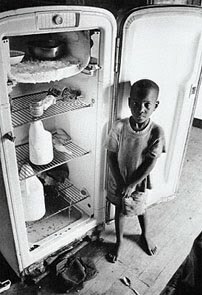 In the United States, single housing, essentially solitary confinement, is a common housing method. Pair housing is the claimed ideal, and group housing, as depicted on Logothetis’s website, is far from the norm. Ringach: You can watch a monkey perform a task while the activity of neurons in their brains is being recorded and a video camera follows the movement of the eyes. The total footage showing the “monkey perform a task” lasts less than 10 seconds; the rest tells us nothing about the monkey’s experience. Notice that the monkey is sipping something. Typically, monkeys being used in experiments like this one are kept thirsty to motivate them to perform. Notice the boilerplate claim that there aren’t pain receptors in the brain: “The animal does not feel the electrodes in its brain, because the brain has no pain receptors.” Yes, that’s true, but not half the story. Scalp and bone are richly enervated tissues. Cutting through the scalp and drilling a hole through the cranium are painful procedures, as is screwing the titanium post directly to the skull. Claims about the brain not having pain receptors are mere distraction, a claim that might divert our attention from the realities of the surgery involved in readying an animal for the electrodes. I’d like to be able to comment on the files listed here, but I am unable to open them. Together with improved (intracutaneous) suture techniques, these innovations in implant materials have substantially shortened the time the animals must spend in a special post-operation chair from around 10 days to only 1 ½ to 3 days. 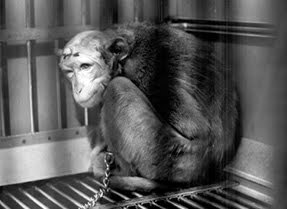 Keeping a monkey locked in a chair for any length of time for anything other than medical care intended to benefit them is torture. Look again at the so-called “Videos of Training Sessions.” The technician has a surgical mask over his nose and mouth for some reason, but no eye protection. Primate vivisectors at UW-Madison told county representatives that the public was at risk of contracting the potentially deadly herpes-B virus when standing about a dozen feet away from a caged rhesus monkey. They made this claim after Beth Griffin died of the disease after, apparently, getting a small bit of saliva in her eye from a young rhesus monkey she was transporting at the Yerkes National Primate Research Center. I mention this only to again call attention to the vivisectors’ willingness to say whatever they think will sway public opinion, regardless of the actual facts. And this is barely a recording of a training session. There doesn’t seem to be much training being depicted. Finally. I hope the picture being painted by Logothetis is a fair depiction of primate experimentation in Europe. Europe is far ahead of the US on matters having to do with the treatment of animals in science. Here in Madison, the situation is much different. One current example is Michelle Basso whose work is something like Logothetis’s. She implants recording chambers and posts on monkeys’ skulls and coils on their eyes. Over the past few years monkeys have died as a result of her fumbling surgical methods. Her work was so inept that the university finally suspended her access to monkeys. She has driven screws completely through their craniums and punctured the dura, the lining of the brain, and caused brain infections that have killed monkeys. She has killed monkeys when trying to repair the post implants. She has a string of many dead moneys behind her. And, to keep this embarrassing situation out of the public eye, the university reinstated her when she threatened to challenge her suspension through a lawsuit. Primate experimentation in the United States is an ugly suffering-filled business. UCLA’s sister facility the University of California San Francisco has been no exception, nor has the University of California, Davis. At UCSF, a stand out only because some of the details became public, is Steven Lisberger. The monkeys in his studies are similarly fitted with skull posts and other hardware. 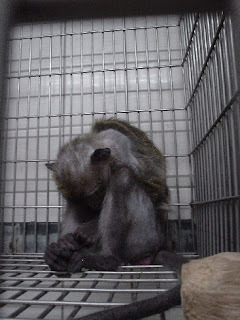 In the haunting undercover image from his lab shown here we see a monkey chained inside a cage. At Davis, titi monkeys, maybe the most trusting and tightly pair-bonded of all the primates, have had parts of their brains burned away to study the effect on their bonding. It’s an evil dark sick business. No vivisector-edited propaganda film can escape the simple facts spelled out in the necropsy reports, the APHIS reports, the daily care logs, the published papers, or the extreme efforts by the vivisectors to keep the real details hidden from public view. Ringach needs to look at his own institution before pointing at propaganda from Germany. At the last Pro-Test for Science rally (then UCLA Pro-Test) I was trying to explain opponents of research that the images of bleeding monkeys shown in their signs were either from decades ago or from other countries, not the US or the European Union, and certainly not representative of research at the University of California. To counteract the effect of such misleading images, one of my colleagues in Germany has made a large amount of information available to the public, not only publishing their animal protocols and methods (which can also be obtained by reading the scientific publications), but also illustrating the experiments with both actual pictures and videos taking from his laboratory. You can see the animals in their living quarters, and watch training sessions and how the animals are transferred from their cages to the Laboratory. You can watch a monkey perform a task while the activity of neurons in their brains is being recorded and a video camera follows the movement of the eyes. There is a detailed and illustrative explanation of how recording chambers are implanted, and how a description of the entire surgical suite and protocols. There is also a nice explanation of why alternative methods are not available that would allow investigators to study brain electrophysiology in the intact animal. This impressive effort by Professor Nikos Logothetis to set the record straight on what is going on inside the laboratories is to be commended and replicated. We hope UCLA and other US institutions can follow up on his example, once researchers and institutional officials become more confident that our openness won’t lead to more threats from animal right extremists. 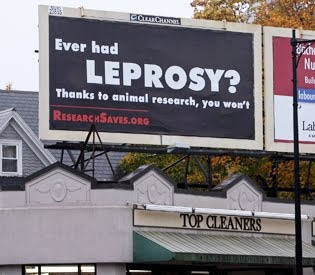 After all, the only way to counteract a campaign of mis-information by opponents of research is to show the public the truth — that research with animals at academic institutions like the Max Plank Institute or the University of California is carried out with responsibility using the most advanced methods available.